i bought this for myself to carry paperwork in after my wedding (got my new initials on it). It is very cute and good quality and practical. Should have gotten them for my bridesmaids too! These bags are very nice! I was nervous about getting these bags in the mall because you never know the quality of things until you actually see them, but these bags are very nice. I think my bridesmaids will love them! This bag looks and feels much better in person than online. I was surprised at the high quality of the bag because it was so affordable. I loved the nylon lining which would allow for easy clean-up's if necessary. My bridesmaids loved the personal touch! A popular gift for bridesmaids, mothers and girl friends, this black and white oversized tote bag is perfect for long weekend trips or just running errands around town. Fill the bag with pampering gifts–cotton pajamas, scented candles, chocolates or even a bottle of their favorite wine. 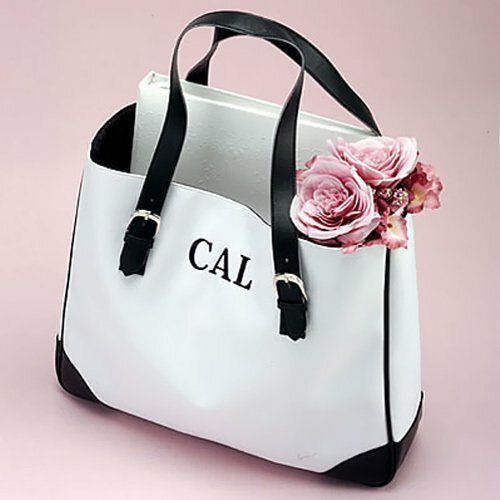 Also great if you are having a destination wedding–your bridesmaids will love to travel with this stylish tote! Made of smooth synthetic material accented with black leatherette trim. Features adjustable handles with silver buckles. Inside is outfitted with a nylon lining and large inner pocket. Custom embroidered with up to three initials. Measures 16"L x 4"W x 13"H.